On this day in 1790, the first patent for a sewing machine was granted. With its invention, sewing machines contributed to the Industrial Revolution and transformed the textile industry. 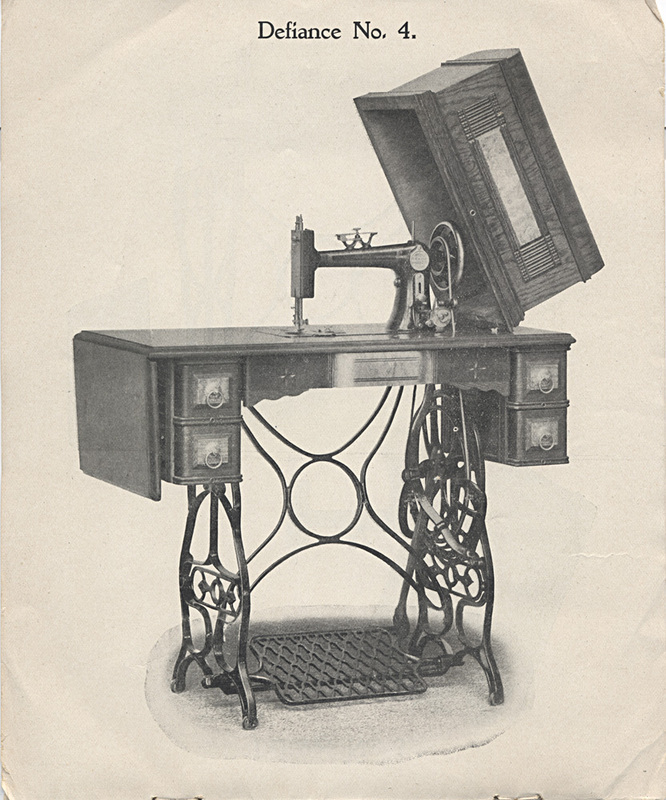 At the National Museum of American History Library, a 1900 catalog from the Trade Literature Collection features Chicago Sewing Machine Co.'s very own Defiance Sewing Machine (pictured), which was patented Oct. 25, 1898. Complete with such features as a self-threading needle and automatic bobbin winder, the Defiance Sewing Machine was "constructed of the best material in use, every bearing, without an exception, being of steel or case-hardened." If you are interested in learning more, the Smithsonian Libraries has a digital collection of sewing machine-related trade literature available. Next Post Have You Hugged Your Cow Today? SI Scholarly Press recently published Smithsonian Contributions to History and Technology, No. 54, by Barbara S. Janssen. This is a two-volume index sorted four ways of the patent models housed at the Smithsonian Museum of American History. There are quite a lot of sewing machine models listed. The center section of each volume has lots of great color photos. Searchable PDFs can be downloaded for free via SI Scholarly Press’s website: http://www.scholarlypress.si.edu.